Discover the awesome power of crystals! These handmade wire wrapped double point crystal dangle earrings are a one of a kind beautiful focal point for any outfit. Crystals vary slightly in size and shape, no two are ever the same. The double point crystals used to make these earrings measure approximately 7/8", not including the wire wrapping loop at the top. Each pair of earrings come gift boxed. Rose Quartz (approximately 12mm x 30mm) - opaque and translucent pink - brings relaxation, inner peace and tranquility. The ability to give and receive love. It's the stone which heals the heart emotionally and physically. All matters dealing with love, affection,compassion and kindness. Aids the heart. These rose quartz crystals are wire wrapped by hand with silver wire. A matching rose quartz wire wrapped crystal pendant are also available in our store. Clear Quartz (approximately 10mm x 30mm) - clear stone - is a receiver, conductor and generator of energy. Used for meditation, transformation, stability, knowledge, protection. healing and enlightenment. Aids in general good health and increases auric field. 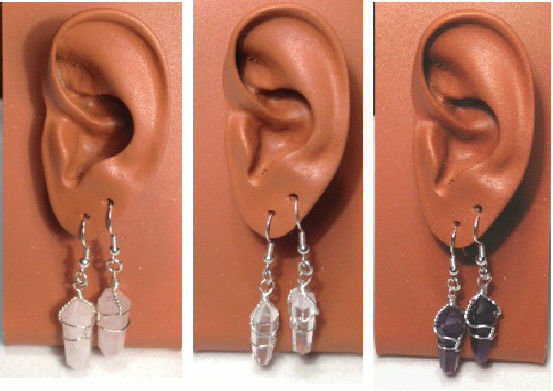 These clear quartz crystals are wire wrapped by hand with silver wire. A matching clear quartz wire wrapped crystal pendant is also available in our store. Amethyst (approximately 10mm x 30mm) - shades of purple, lilac or mauve - worn to guard against drunkenness and to instill a sober mind. Used as a dream stone and to help insomnia. Put an amethyst under your pillow to bring about pleasant dreams, or rub it across your forehead to offer relief from a headache. Worn as protection from self-deception, as well as a protection against witchcraft. The amethyst has long been used to open the spiritual and psychic centers, making it one of the power stones. It is also used as a meditation aid when worn as a necklace. These amethyst crystals are wire wrapped by hand with silver wire. A matching amethyst wire wrapped crystal pendant is also available in our store.